Rice (Oryza sativa) is one of the principal foods for a large part of the worlds human population, but its productivity is reduced by the toxic effects of heavy metals such as lead. In the present study seeds of the rice cultivars KSK-133, NIAB-IR-9, Basmati-385 (B-385) and Shaheen Basmati (SB) were treated with different concentrations of lead chloride (PbCl2) (0, 250, 500, 1000 and 2000 ppm) to evaluate the effect on germination, seedling growth and some biochemical attributes. Lead had no effect on germination percentage, except cv. SB at 2000 ppm. Germination rate, root and shoot length and dry weight decreased with increasing lead concentrations. A sand culture experiment was conducted to measure the ion contents (Na, K, Ca), photosynthetic pigments, total protein and nitrogen contents. Chlorophyll a, chlorophyll b and carotenoids decreased with the increasing concentration of lead. Three varieties (NIAB-IR-9, KSK-133 and SB) had a decreasing trend in potassium and calcium ions and increasing in lead ion concentration. There was an increase in sodium ion concentration with the increase in lead concentration but B-385 showed contrary results. Results confirm that lead has an inhibitory effect on plant growth and development. Efforts were made to develop proper protocol for establishment of aseptic conditions as well as efficient initiation and multiplication of in vitro cultures of olive cultivar “Uslu”. Our work inquires that the main factors such as media composition; growth regulators, fungicide (mancozeb) and bacteriocide (Clorox) have prominent effects on the micropropagation of the selected olive cultivar. The effectiveness of different treatments, in terms of concentration and time, was investigated for optimization of aseptic conditions.For controlling fungal contamination; the best results were achieved when 5gm mancozeb was used for 75 minutes, while 50% Clorox treatment for 5 minutes was found to be the best for controlling bacterial contamination. After sterilization, medium for direct shoot regeneration and proliferation were optimized. The explants were cultured on olive media containing different concentrations and combinations of auxins and cytokinins. Among the treatments used, the highest sprouting rates were observed in the media containing 6-Benzyleaminopurine3.5 mg/L and 1-Naphthaleneacetic acid 1.5 mg/L. Our findings accentuate on the fact that the applicability of the optimized methods should be evaluated for olive cultivars of commercial value. Berberis lyceum is an economically and medicinally important genus distributed abundantly in the mountainous ranges of Pakistan. The color of hairs on the leaves of B. lyceum genotypes was pale to brown while the branch color was brown in all B. lyceum genotypes. Similarly, flower color was pale yellow while the plant height was ranged from 2.0 to 5.0 meters. Average length of lamina was 2.4 cm, average numbers of thorns per branch were 50.0 and average number of berries per branch was 18. Leaves tend to have comparatively high phenolic compounds that can interfere with DNA isolation. DNA-based markers are becoming popular for the identification of plants. Molecular genetic diversity studies of Berberidaceae family are almost lacking, which revealed the neglected status and the extent of the gap in the knowledge of this family. Mercaptoethanol being a reducing agent directly or indirectly causes damage to DNA. It is one of the limiting factors found in our study that can inhibit the oxidation process and at its low concentration brown viscous DNA pellet was extracted from fresh leaves while at high concentration intact whitish DNA pellet of good quality was observed that found suitable for PCR amplification. The DNA quantity and quality from dry leaves were quite low that was improved with the increase in the concentration of β 2-mercaptoethanol. It is concluded that a combination of 1% PVP and 0.01 to 0.06 % β mercaptoethanol was found satisfactory for extracting DNA from fresh and dry leaves of B. lyceum genotypes. Further, fresh and dry leaves were not able to exhibit any significant effects. Microorganisms are important source of proteases which are employed in detergent, food, pharmaceutical, leather and photographic industries. Among microorganisms, bacteria have been widely explored globally for their protease production that leads to discovery of several novel proteases. 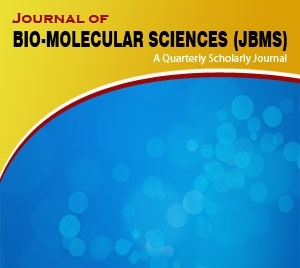 The present research work was carried out to explore the indigenous protease producing soil bacterial flora of Karak, Khyber Pakhtunkhwa, Pakistan. A total of 60 bacteria were isolated from 16 soil samples collected from different sites in district Karak. The isolates were screened for protease production by using skimmed milk agar. Among all the isolates, 18 bacterial isolates were found protease producers with various degree of protease activity. These isolates were further identified through their morphological, microscopic and biochemical examination. It was concluded that soil of Karak is rich in protease producing bacteria that exhibit diversified proteolytic activities and biochemical features. Further optimization of protease activity and their structure elucidation may be performed which will be helpful to identify novel protease. Nanotechnology from the very beginning has been implicated to be useful in various fields of science, owing to its interdisciplinary dimensions. Various studies around the globe have resulted in a plethora of information regarding the diagnostic and therapeutic potentials of nanotechnology. Different kinds of nano-structures have been produced with unique properties due to their peculiar sizes with propositions in medicine and healthcare. Such nano-scale structures with their prospective geometries are very important in relation to their functionalities. Moreover, modifications on surface of nanoparticles have been impregnated to bring changes that can provide desired effects. Targeted drug therapy by nanoparticles is a subject of recent interest, as it focuses on removing the side effects of certain conventional therapies. Various viral infections have been explored by targeting effects of nanotechnology. Conventional methods, targeting viral infections have certain drawbacks, which can be tackled by nanotechnological approaches. This review focused on the current status of nanoparticles in specific systems that work against viruses, using the conceptual translation of the nano-scale moieties. Different targets for various virology related entities have been exploited and resulted in promising aspects of targeting agents and nano-therapeutics.